It takes a special kind of ‘so dreadful it’s good’ movie to earn the title ‘the Citizen Kane of bad movies’, but that indeed is an honour bestowed upon The Room. No, I don’t mean the 2015 Brie Larson Oscar-winning movie (which is simply called ‘Room’). ‘The Room’ was a passion project of the highest order, and shows just what happens when someone with time on their hands, and seemingly unlimited funds, is allowed to indulge their desires. Written by, directed by, produced by, and starring Tommy Wiseau, it has become something of a cult classic, despite the fact that it is appallingly bad. 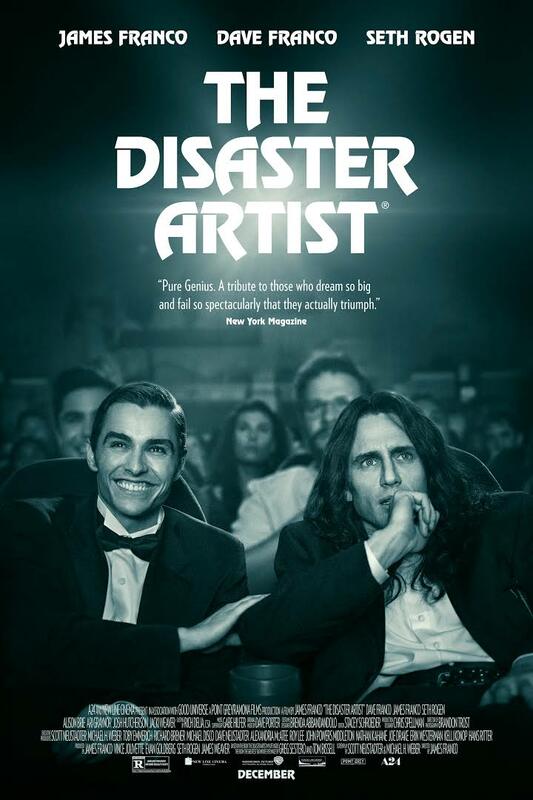 The Disaster Artist tells the story of the making of that flick, from the time Tommy meets a young actor called Greg Sestero, to their decision to move to LA to make it big, to the lightbulb-moment Tommy decides to make his own movie, to the premiere. Did I mention that The Room is truly dreadful? Therefore, recreating the scenes from it offers some moments of true hilarity. Also, Wiseau is beyond eccentric. With bucket-loads of confidence, and a seemingly bottomless-pit of cash, he absolutely had a vision for the work, and believed he was making a masterpiece. To this day, no-one knows where the money came from, but it is believed he spent an astonishing $6 million on The Room. Unfortunately, it wasn’t all plain sailing, and his cast and crew became increasingly resentful of his ego and attitude during the shoot. The elder Franco takes Tommy’s eccentricities and runs with them. I find him a bit hit-and-miss in terms of his performances in general, but he is very impressive here, bringing both humour and pathos to the role. His younger brother takes on the role of Sestero, Wiseau’s only friend, who also appears in The Room. Despite a very dodgy wig (which is somewhat distracting in the beginning) he acquits himself well, and the pair make a great double-act. The rest of the cast reads like a who’s who, with numerous cameos from Hollywood’s great and good, who all seem to relish being part of this tale. Thankfully, the story is far less fractured, and the production values are far higher, than the film that inspired Disaster Artist, so the audience can instead concentrate on the sheer madness that unfolds. This really is one of those ‘you couldn’t make it up’ stories, and, as the director as well as star, Franco has tried to create an organised chaos. On the whole, he succeeds. You still get the sense of the manic energy behind The Room, but there is much more to this. It is laugh out loud funny in parts – the whole cinema was howling at the screening I attended. Yet it also has a tragic quality. Even if you have never seen The Room (and it is not necessary in order to enjoy this) you can see how bad the final product is going to be, and it is like watching a car crash. The Disaster Artist is a really good movie about a really bad movie. No prior knowledge of the inner workings of Hollywood is required, as it is more a tale of the fragility of the human ego. It’s the kind of movie that shouldn’t work, but does, and unlike its inspiration, it should find itself nominated for more than a few gongs in the forthcoming awards season. So in a weird way, Tommy Wiseau’s vision has been somewhat vindicated. In Cinemas December 8th, with previews from today, December 6th!